Even dead trees have a story of their own, representing many years of living with the elements of Nature around them, through sunny mornings and misty dawns, through downpours, drizzles, and storms and what have you….in fact, anything and everything that Nature would throw at them. And even after they’re dead, they stand to wait for someone to make something useful out of them, perhaps! 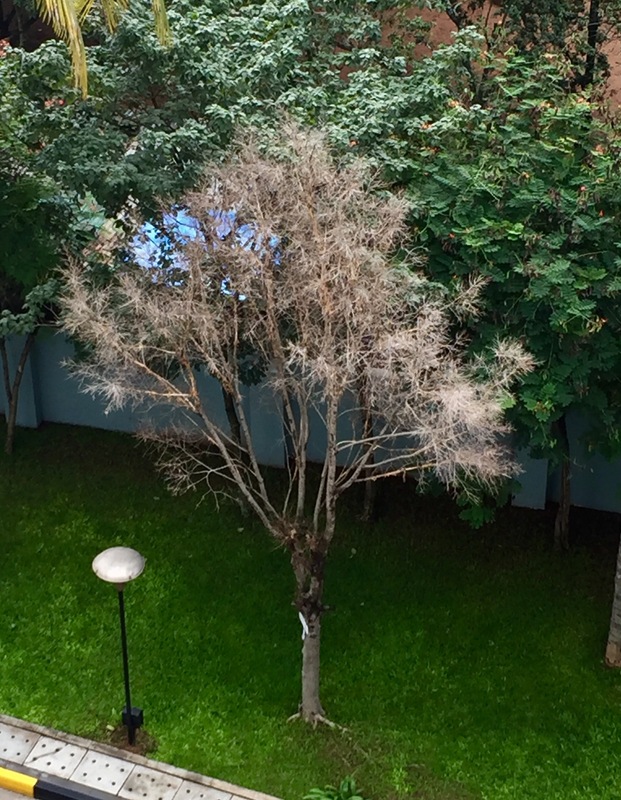 Today, I’m sharing the picture of a dead tree I see every morning, in my apartment complex, quietly sharing space with the rest of the living ones. The dead tree brings to my mind a profoundly wise old man, who has seen life in all its hues, who has cared for the world in spite of not receiving any love in return…and who now awaits his end, with pride and dignity. Even in death a tree looks beautiful doesn’t it? Seeing dead trees is very sad for me. I hate to see the uprooted ones even more; every storm there seem to be so many tall healthy green ones that have been tossed aside by the storm’s fury! Whenever I pass trees which look top heavy, I wish I could stop and shear them to the right width and height – it saddens me to see that the city muncipal dont maintian the trees, making them vulnerable to being uprooted. I agree that dead trees tell us a story. But you know what? I feel there is life in dead tree too. Have you seen how sometimes a dead tree just goes green again after a long time? That tells me, things can get better. Some times they take time though. Thanks for joining, Esha! The post went live at 7 pm today. So I was late. Dead tree does not create a good feeling but there is some good in this one. It is dead but still standing with laid out branches laden with leaves as if in freeze. A dead tree serves many purposes in life. For the photographer, it stands out. I pass two dead trees every morning on my walk to the bus and I haven’t taken notice. I should.